The Baader UV-IR Cut/L Filter is a must for all digital imaging with DSLR cameras, CCD cameras, and modified webcams. It removes the unwanted UV and IR wavelengths from your images by blocking UV below 400 nm and IR above 680 nm. The Baader UV-IR Cut filter is also useful for protecting valuable H-Alpha filters from heat stress and damaging IR (Daystar, etc). 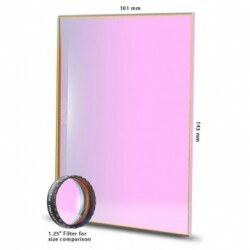 This giant UV-IR Cut filter is sized for professional video cameras. It is 101 mm x 143 mm square, 3 mm thick, and unmounted. Due to their extremely high optical quality, these filters may be stacked and used far in front of the focal plane (necessary for imaging uses). Like the Baader Planetarium Contrast-Booster, the UV / IR Cut filter uses the very latest coating technology to deliver the finest filtration quality, and lifetime durability. This giant Baader UV-IR Cut/Luminance Filter is 101 mm x 143 mm square and unmounted for placement in appropriately sized professional video movie cameras.